Thanks for posting. Speccys are a bit special aren't they. Good looking gold, Dave. Half your luck. We didn't make it to WA this year as we have a very busy year. But we did get some time in swinging in Vic and Tibooburra to keep the withdrawal symptoms away. Keep up the good work, love those pix of gold even if I do get a smidgon jealous. 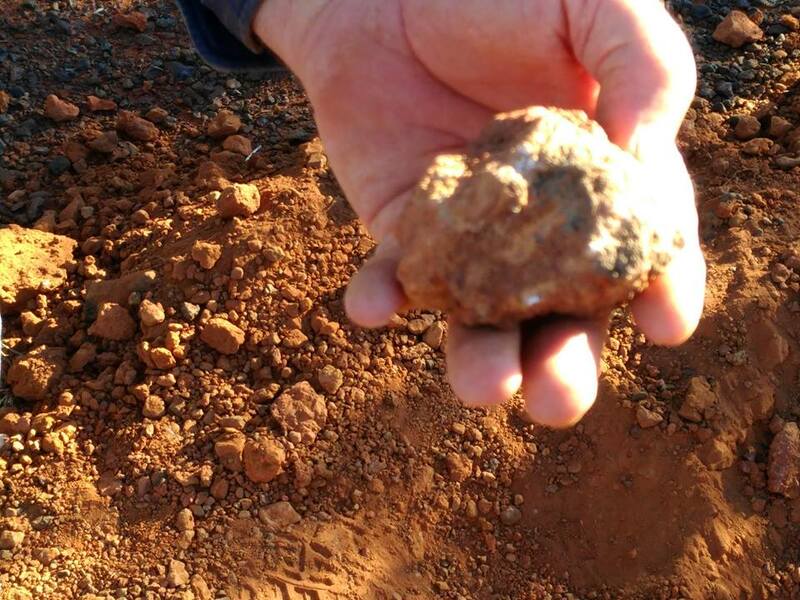 Thanks for your comments Detectist and granite2, yep just trying to encourage people to keep trying, it is getting less but still quite ok if you do the hard yards, and yes granite2 WA is a great place to be detecting, and I hope your year is going well. 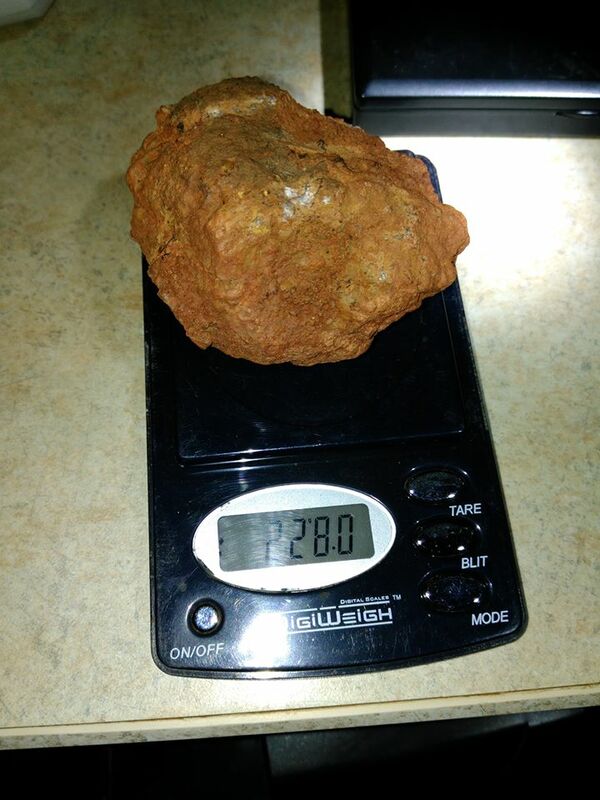 228 gram specie with plenty of gold inside, about 18" to 20" deep, found with the 14" GPZ coil and the mighty 7000. 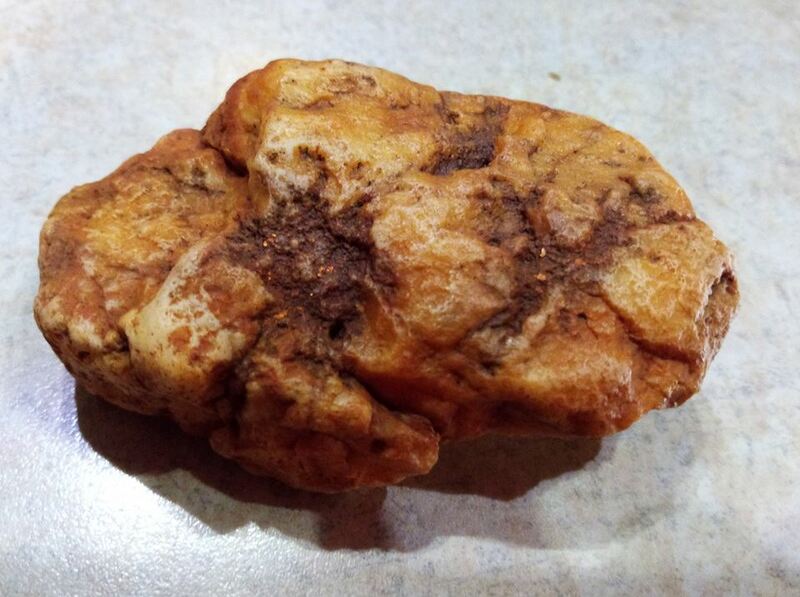 Video of a 4.6 gram nugget being uncovered. Keep them coming D&V. No doubt very exciting digging that specie? Have you worn your Hi-Viz shirt out or laying low? Nightjar wrote: Keep them coming D&V. No doubt very exciting digging that specie? Thanks Peter, and the Hi-Viz was put in the cupboard for this outing, we had the Exploration holders permission for the area but it was so close to the road we didn't want others stopping in (you know), we even brushed out our tracks in to where we camped. Nice gold & beaut size speci there Dave. Hope it cleans up well. Thanks Kon, I got an idea that the specie will end up in the dolly pot and get melted into a nice shiny bar like this when we get home. 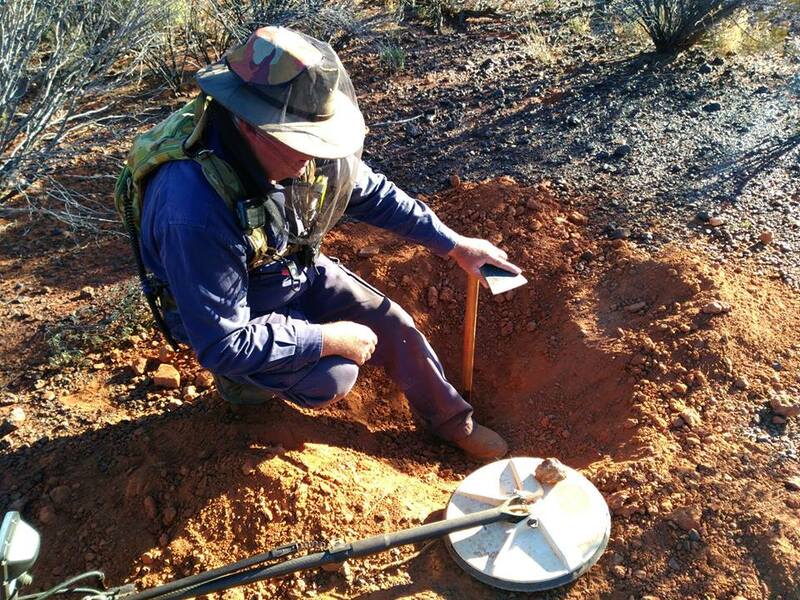 Some of the digging that was involved in getting the 228 gram specie out of the hole. Very hard going. Some nice gold. Just watched the video and cannot wait to see part 2. Hard digging by look of it. Will test out your back. Travelergold wrote: Some nice gold. Just watched the video and cannot wait to see part 2. Hard digging by look of it. Will test out your back. Certainly worth the effort, thanks for sharing. Hope there is more of the same. 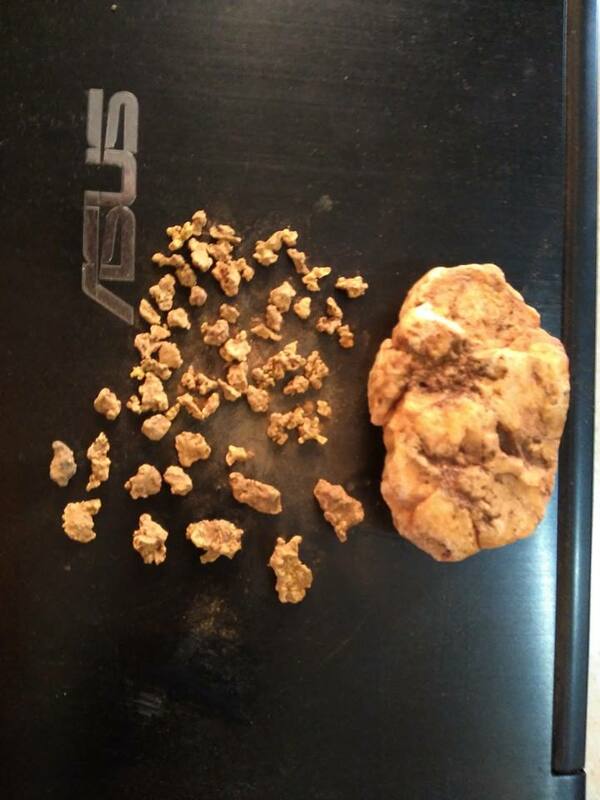 After a bit of a clean up, 202 grams dry weight now and about 30 grams of gold I reckon, 135 grams wet weight. An ozer in disguise. Are you still going to crush? 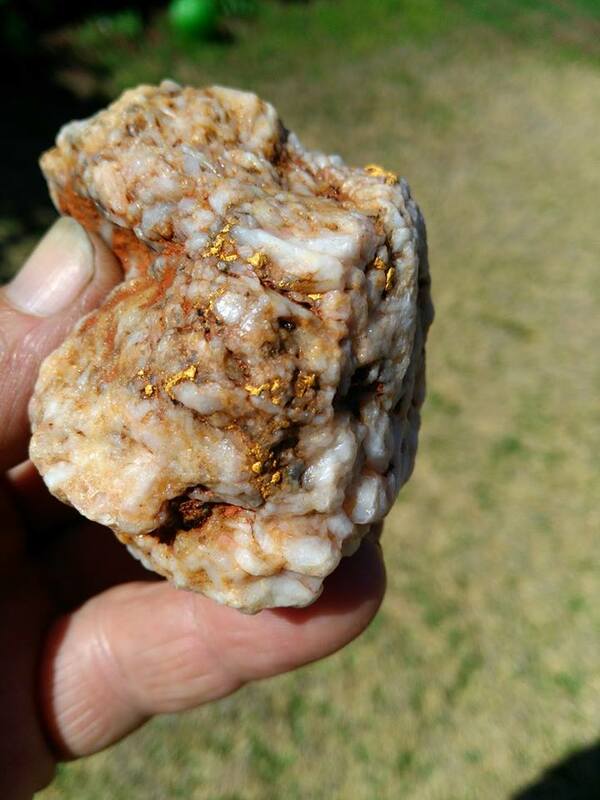 Thanks Detectist, I thought I would give it a good clean up to see how it looked, it seems most of the gold is locked inside, so I might just have to free it in the dolly pot, and there are a line of others heading the same way, I reckon 2.5 to 3 ozs will be free from the confines of being rock bound in the end. Nice one Dave, well done. According to your wet/dry weight calculations, I came up with 27 grams of gold in your specie. It be good to know the final outcome, if & when you happen to extract the gold out of it. Kon61gold wrote: Nice one Dave, well done. According to your wet/dry weight calculations, I came up with 27 grams of gold in your specie. It be good to know the final outcome, if & when you happen to extract the gold out of it. Thanks Kon, yes the SG calcs are a bit of an inexact science, it's just a bit of an indication I reckon, as you need to know the exact purity of the gold in the specie and the exact makup or the host rock and the temp and PH of the water and the elevation where the calcs are made. Like I say it's just an indication that there is a reasonable amount of gold somewhere inside. Kon61gold wrote: It be good to know the final outcome, if & when you happen to extract the gold out of it. Final outcome was just over 27grams plus some fines that were collected with mercury, so I reckon close to 28 grams in total. 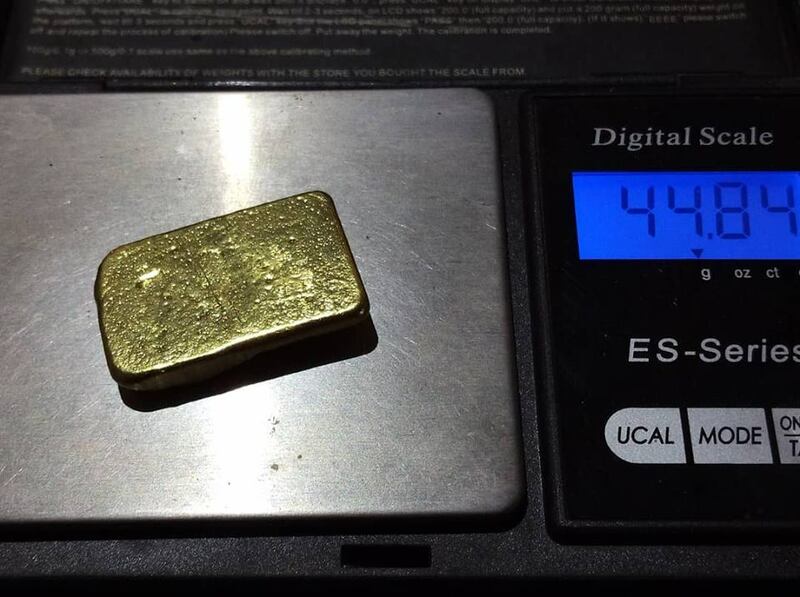 Some other species were added and a gold bar weighing a bit over 44 grams is the result. Thanks Dave & well done. Thanks Jen, and Kon, it's good to be making a nice gold bar. That specie cleaned up nicely and the end results of your other species included, very nice result. Thanks for sharing your story and your pictures as well. Thanks Mike, and I hope you and Jen had/having a good trip also. And the 2300 was going well in the area. Nice to see! Must be getting a bit warm over there by now. My wife and I are planning to go over next year. I hope you guys have left some for us! Thanks Detectist, yes it would be I reckon, we been back home about a month now, go back next year when it cools down a bit. and there should still be some left, caus it's a damn big place over there.